Make these better-for-you Sweet BBQ Chicken Kabobs at your next barbecue. 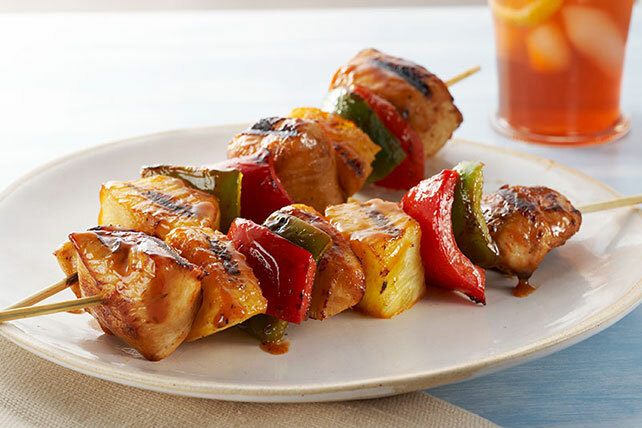 These Sweet BBQ Chicken Kabobs have an island vibe thanks to the OJ & pineapple. Thread chicken alternately with pineapple and peppers onto 8 long wooden skewers, using 2 skewers placed side-by-side for each kabob. Mix barbecue sauce and juice concentrate; brush half evenly onto kabobs. Grill 8 to 10 min. or until chicken is done, turning and brushing occasionally with remaining sauce. Soak wooden skewers in water 30 min. before using. Wrap ends with foil before grilling to prevent them from burning. If using metal skewers, use just 1 metal skewer when assembling each kabob. Prepare as directed, substituting 1 lb. skinless salmon fillets, cut into 1-inch chunks, for the chicken. Or, substitute 1 lb. uncooked peeled and deveined extra-large shrimp for the chicken, reducing the grilling time to 4 to 6 min. or until shrimp turn pink. Substitute 1 drained can (20 oz.) pineapple chunks in juice for the fresh pineapple.